In Anatomy and Physiology (A&P) one of the earlier topics covered is the skeletal system. When we examine the pelvis (comprised of two ilia, the sacrum and the coccyx), questions about differences between men and women always arise. Can you tell the difference simply by looking at the bone structure? 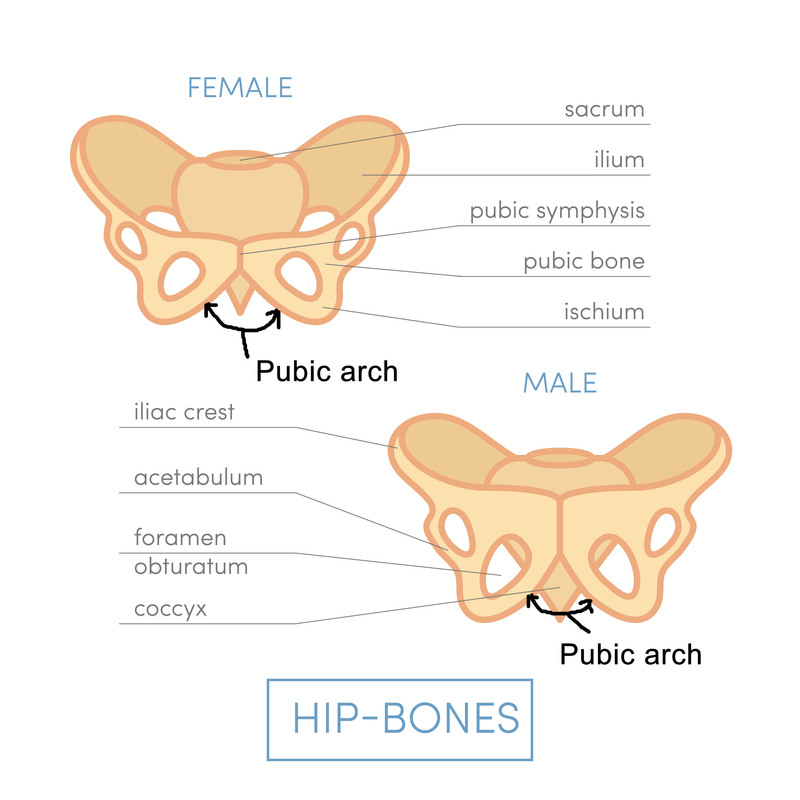 The female pelvis tends to be wider, and the male pelvis appears taller. The pubic arch in women is obtuse (90-100 degrees), but in men the angle is acute (~70 degrees). Why the wider pelvis for women? You’ve probably guessed: to facilitate childbirth. This wider pelvic structure also shifts our center of gravity (body mass) to a slightly lower portion of our bodies compared to men. And there’s a fun way to demonstrate this to both students, friends and family. My 16 year old son graciously agreed to model this for us. 2) Place your foot against a wall (door). 3) Place your other foot behind the first. 4) Step the first foot behind the second. 5) Bring both feet together. 6) Move the chair in front of you. 7) Bending *only* at the waist, form a 90 degree angle, leaning your head against the wall. 8) Now lift the chair to your chest. 9) Now stand up. KEY POINT: Do not bend your knees, raise onto your toes, or lower the chair. That would be cheating. The women in my college A&P class went first. They easily stood up, wondering what the big deal was. I grinned and invited the men of the class to try. Guess what? Just like my son, they were stuck to the wall, unable to pull their head away. After much frustrated grunting and grumbling, they gave up, dropping the chair. Women, with their lower center of gravity, can easily stand. Men, especially those with broad shoulders, will be stuck tight. Now I will put in the caveat that humans, male and female, have a range of body types. Exceptions to the rule most likely exist, but I’ve yet to find one myself. *This trick isn’t really relevant pre-puberty.